"THE MISMATCHED VEDHA PORUTHAM OF THIRUVATHIRAI AND THIRUVONAM NAKSHATRAS"
The Thiruvathira Boy marrying a Thiruvonam Girl would invite imperfect "Vedha Porutham". Hence it should be avoided. The Thiruvathira Girl marrying a Thiruvonam Boy would also invite imperfect "Vedha Porutham". Hence it also should be avoided. Labels: Marriage Match, Thiruvathira, Thiruvonam, Vedha Porutham. "STREE DHEERGHA PORUTHAM (SUMAGALI PORUTHAM) FOR THIRUVONAM GIRLS"
We have studied various aspects of Stree Dheergha Porutham. Now let us see the "Stree Dheergha Porutham" for the Thiruvonam Girls. 1. The Girls who has the Thiruvonam as their Birth Star. 2. The Boys who choose their wife or the girl to be married with Thiruvonam as their Birth star. 1. Best Match: Pusam, Ayilyam, Magham, Pooram, Uthiram, Hastham, Chittirai, Swathi, Visakam, Anusham, Kettai, Moolam, Pooradam and Uthiradam. 2. Average Match: Aswini, Bharani, Kiruthigai, Rohini, Mirugasirisa, Thiruvathira and Punarpusam. 3. Worst Match: Avittam, Sathayam, Purattathi, Uthirattathi and Revathi. The Mahendra Porutham denotes the ability of conceiving and delivering a baby. The Girls having Thiruvonam as their "Birth Star" (Jenma Natchathiram) must choose their life partner from the following list. For the Boys, whose life partner's bith star is Thiruvonam, then they must look for the compatability of their "Mahendra Porutham". Perfect Match: Thiruvonam, Purattathi, Aswini, Rohini, Punarpusam, Magham, Hastham, Visakam, Moolam and Pooradam. For more information on Gana Porutham, please visit What-is-gana-porutham? Now let us see the compatability of the Gana Porutham for Thiruvonam Boys. Perfect Match: Aswini, Mirugasirisa, Punarpusam, Pusam, Hastham, Swathi, Anusham, Thiruvonam, Revathi, Bharani, Rohini, Thiruvathirai, Pooram, Uthiram, Pooradam, Uthiradam, Purattathi and Uthirattathi. The Boy's with Thiruvonam as their Jenma Natchatira (Birth Star) can choose their wife as per the details given above for a perfect Gana Porutham. For more information on Gana Porutham, please visit What-is-gana-porutham? Now let us see the compatibility of the Gana Porutham for Thiruvonam Girls. Perfect Match: Aswini, Mirugasirisa, Punarpusam, Pusam, Hastham, Swathi, Anusham, Thiruvonam and Revathi. Medium Match (Level 1): Bharani, Rohini, Thiruvathirai, Pooram, Uthiram, Pooradam, Uthiradam, Purattathi and Uthirattathi. Medium Match (Level-2): Kiruthigai, Ayilyam, Magham, Chittirai, Visakam, Kettai, Moolam, Avittam and Sathayam. The Girls with Thiruvonam as their Jenma Natchatira (Birth Star) can choose their husband as per the details given above for a perfect Gana Porutham. Now let us see the Thiruvonam Girl's perfect Nakshatra Porutham. Avittam, Purattathi, Revathi, Bharani, Kiruthigai, Mirugasirisa, Punarpusam, Ayilyam, Uthiram, Chittirai, Kettai and Pooradam. 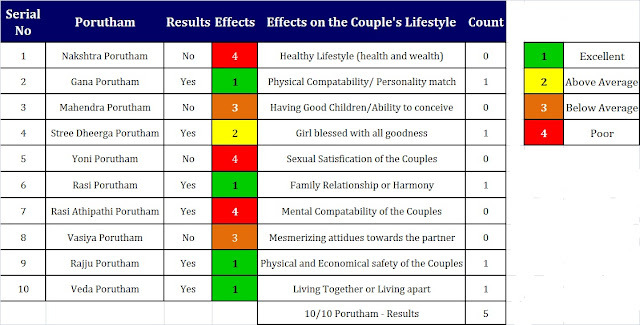 The Thiruvonam Girls/females must choose their life partner only from the above list for a perfect Nakshatra Porutham. If they do, then we can assume that they would lead a healthy and normal lifestyle. Let us see the Best Match for those who are born with Thiruvonam as their Birth Star. Average Match (only for female Thiruvonam): Aswini, Bharani, Rohini, Thiruvathira, Ayilyam, Magham, Uthiram, Chittirai, Swathi, Kettai and Purattathi. Average Match (only for male Thiruvonam): Mirugasirisa, Punarpusam, Pooram, Hastham, Visaka, Anusham, Moolam, Uthiradam, Avittam, Sathayam, Uttirattathi and Revathi. Worst Match: Kiruthigai and Pusam.